At the outbreak of the First World War in 1914, the United States remained on the sidelines as America continued to engage in commerce with European countries on both sides of the conflict. However, by early 1917 the United States had begun to prepare for war. Following the sinking of the ocean liner Lusitania and other commercial and passenger vessels, public opinion turned against Germany. By February of 1917, Congress passed a $250 million appropriations bill to ready the United States for war. On April 2, President Woodrow Wilson abandoned his policy of neutrality and called on Congress to declare war against Germany. 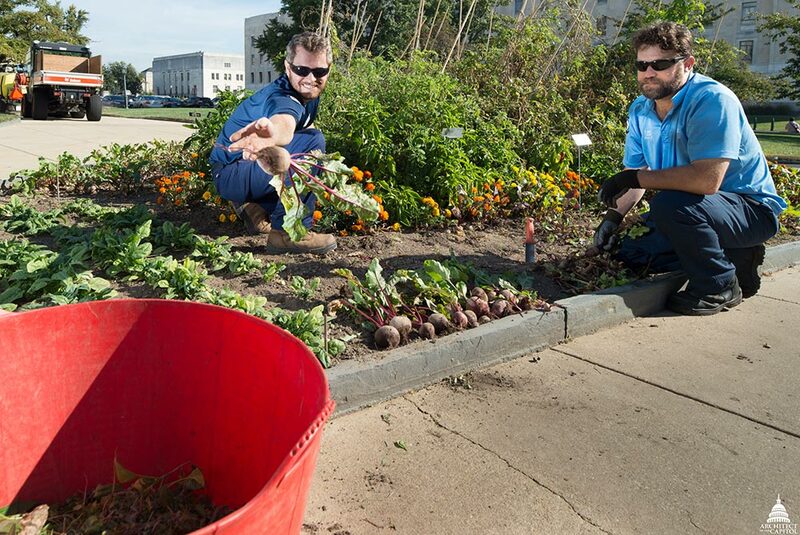 To mark the centennial of the United States entering World War I, the Architect of the Capitol’s Library Buildings and Grounds team recreated period-appropriate "War Gardens" in raised beds located on the grounds of the Thomas Jefferson Building. The gardens coordinate with war-related exhibits at the Library of Congress and the U.S. Capitol Visitor Center. Period posters encouraging Americans to garden circa 1917. Photos courtesy of the Library of Congress. 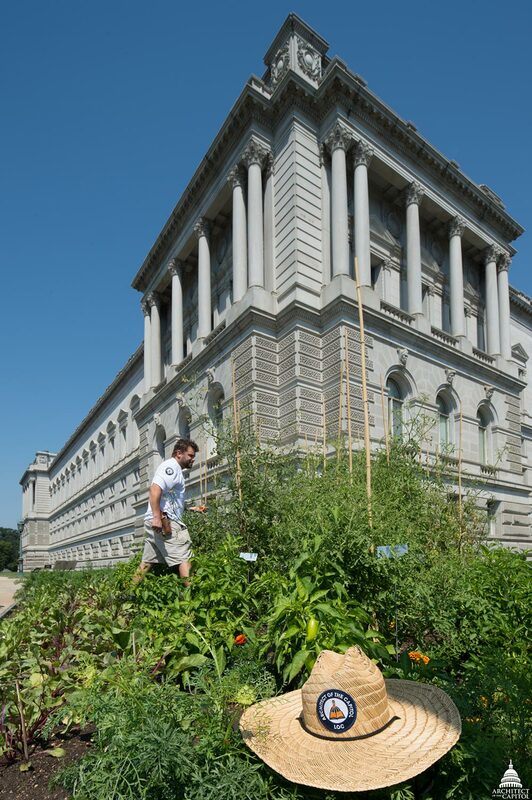 The Library of Congress' Chief of Visitor Services, Giulia Adelfio, suggested planting vegetables to tie into their upcoming exhibit. 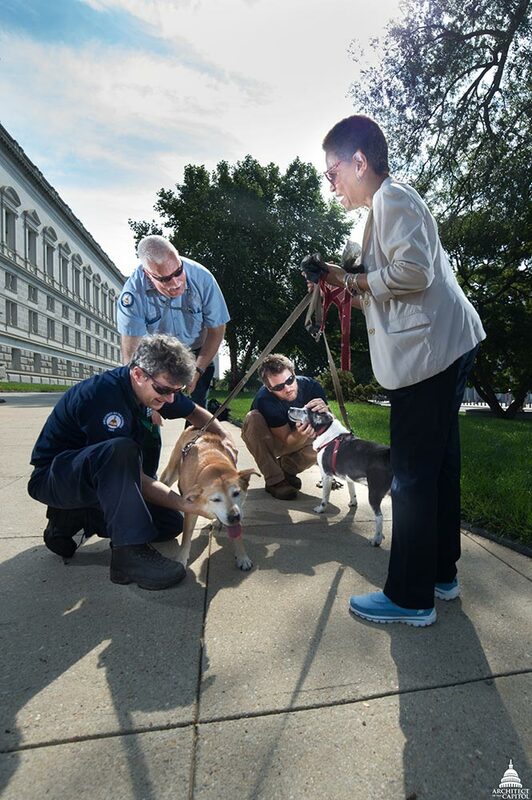 "I remembered that in 2000 as part of the Library of Congress bicentennial celebration, the Architect of the Capitol (AOC) planted flowers based on a garden in 1800. That memory along with seeing the herb and greens perennial bed already planted in front of the Jefferson Building gave me the idea," she said. Ultimately, Adelfio reached out to the AOC gardening team to pitch the idea and was pleased with the enthusiastic response. The War Gardens were a labor of love for the AOC. According to Robert Gimpel, a gardener with the AOC, "War gardens were the brainchild of Charles Lathrop Pack and his National War Garden Commission. During the war, a severe food crisis emerged in Europe, as farmworkers enlisted in the military and agricultural lands became battlefields. 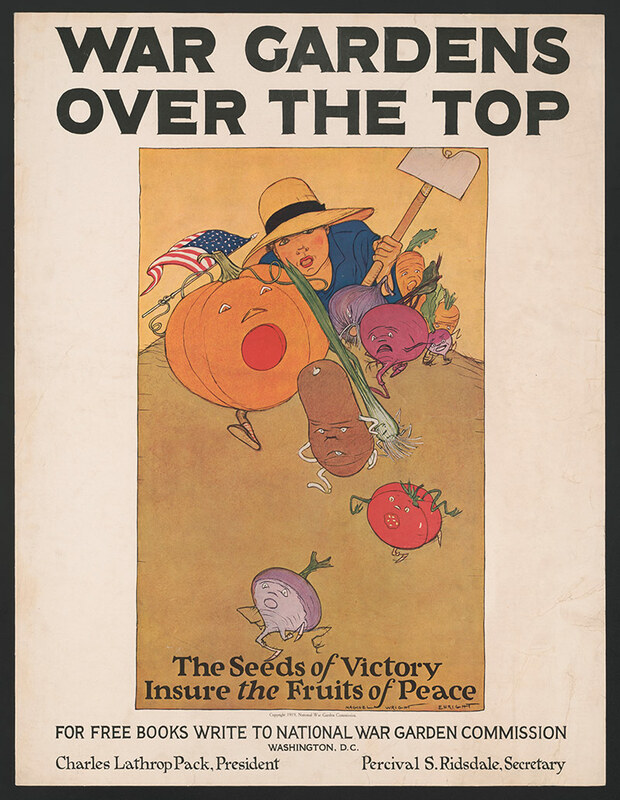 To increase the self-sufficiency of the United States, the National War Garden Commission was organized to increase the food supply for Americans through home gardening." School children, housewives and patriotic citizens were encouraged to reclaim underused spaces, including public parks, school yards and private residences, to plant vegetable, fruit and herb gardens. Three million new garden plots were planted in 1917 and more than 5.2 million gardens were cultivated in 1918. 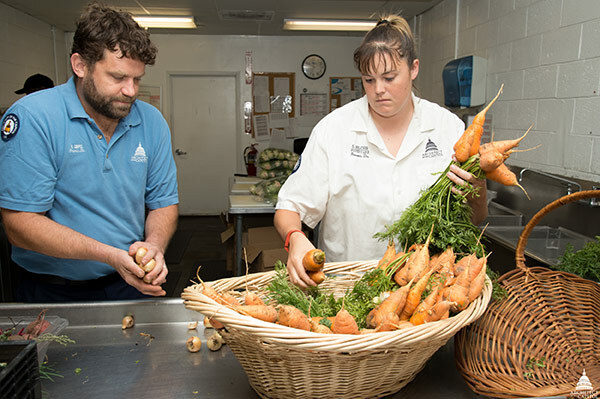 The gardens generated an estimated 1.45 million quarts of canned fruits and vegetables. 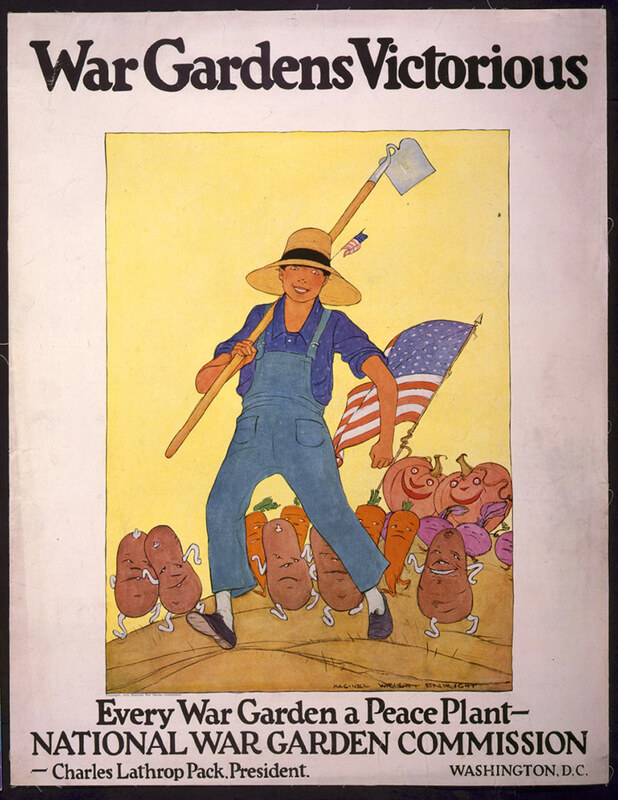 By the end of World War I, the home gardening effort was referred to as victory gardens. Teams across the agency supported the project in a variety of ways, including creating signs like the one above to help visitors identify crops. The Library Building and Grounds team researched 1917 vegetable crops to select heirloom varieties that were available to the public during the war years. The grounds team incorporated succession planting and companion planting into their garden plan. They also used period materials for staking and trellising. "Our only planned change from period practice was the artful arrangement of the crops in each bed to make the gardens more aesthetically pleasing. Straight-line row cropping was practiced at the time," said Gimpel. The gardening team grew a little bit of everything in the beds dedicated as War Gardens. Arugula, pole beans, beets, cabbage, chard, corn, cucumber, dill, kohlrabi, leeks, lettuce, onions, peas, hot and bell peppers, pumpkins, radishes, spinach, squash and tomatoes flourished on campus. "I used primary source documents to find crops that were complimentary and/or could be and would provide a full season of growth. Once I had identified which plants we would grow, I tried to find seed sources for cultivars that were specifically mentioned in the publications. When I wasn’t able to find a source for those varieties, I then scoured the catalogs for other varieties that had an introduction year before 1917," said Gimpel. One bed, located on the northwest corner of the Jefferson Building, houses medicinal and culinary herbs and predates the War Garden project. The gardening team made no changes to that bed primarily because the herbs met the self-imposed requisite of being introduced before 1917. Gardening Supervisor Sally Belcher grew up on a farm and had extensive knowledge of growing produce. She used the War Gardens as a way for members of her crew to work together and lead a project from start to finish. "I gave my input and suggestions when needed but for the most part, I let Rob and his fellow gardeners run with it. Watching the crew collaborate together to complete this project and get this much praise has been incredible. Being able to share compliments with them about the War Gardens has helped increase morale in our shop," said Belcher. In fact, the War Gardens project was a great example of the AOC operating as one team, one mission. To get the needed heirloom varieties, nearly all of the vegetables were started from seeds. Many of the vegetables were sown straight into the beds while others, like tomatoes and peppers, had to be started in a greenhouse. The U.S. Botanic Garden (USBG) provided the library gardeners with greenhouse space at the production facility, pots, potting soil, water and fertilizer. Gardeners with the USBG helped take care of the plants until they were ready to be planted in the War Garden beds. The Library Buildings and Grounds machine shop manufactured posts for garden signs and the carpenter shop engraved plant labels. The Photography Branch took photos of the gardens throughout the growing season. And the Communications and Congressional Relations team designed signs for the gardens and posted bi-weekly updates to the agency’s social media channels. People and animals alike enjoyed walking around the War Gardens. "The public response to the War Gardens is astonishing. While we get plenty of compliments from the public on our flowers and the general appearance of the grounds, I find that almost every person that walks past while I'm working there stops to read the signs, talks about the vegetables they see and tells us how great it looks," said Gimpel. 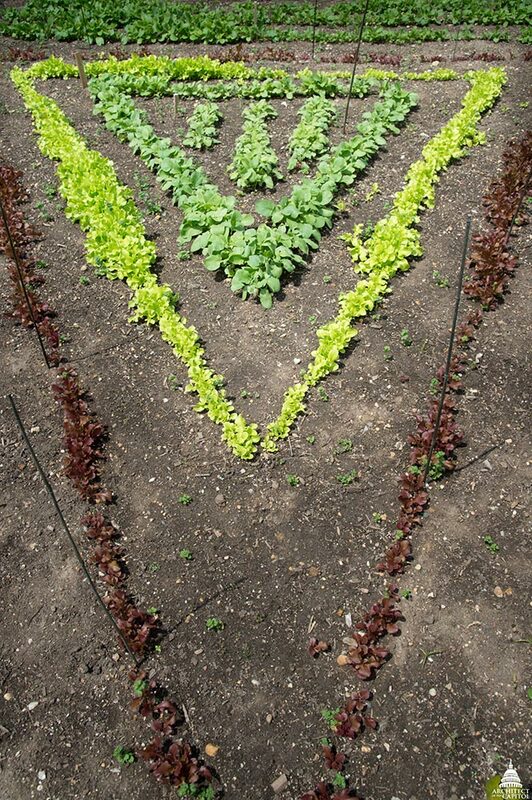 Keeping a vegetable garden looking attractive as well as being productive is more labor intensive than flower plantings. Yet the Library grounds team rose to the challenge. Some of the plants were susceptible to various diseases and pests. White flies on the cabbage family vegetables, stem borers and squash bugs on the squash, and rodents nibbling on tomatoes were all confronted in-kind. The gardeners manually picked off eggs that they found from some insects, planted marigolds that have insect repellant properties, engaged in staking, and correct siting and co-planting to fend off pests. "Pest control is also where I found some of the limits to period-appropriate methods: The School Garden Army manual stated: 'Arsenate of lead is the most generally useful insecticide for protecting crops from plant-biting insects.' This pesticide has been out of common use since the 1950s, and banned since the 1980s. I think we’ll give that period material a pass," said Gimpel. 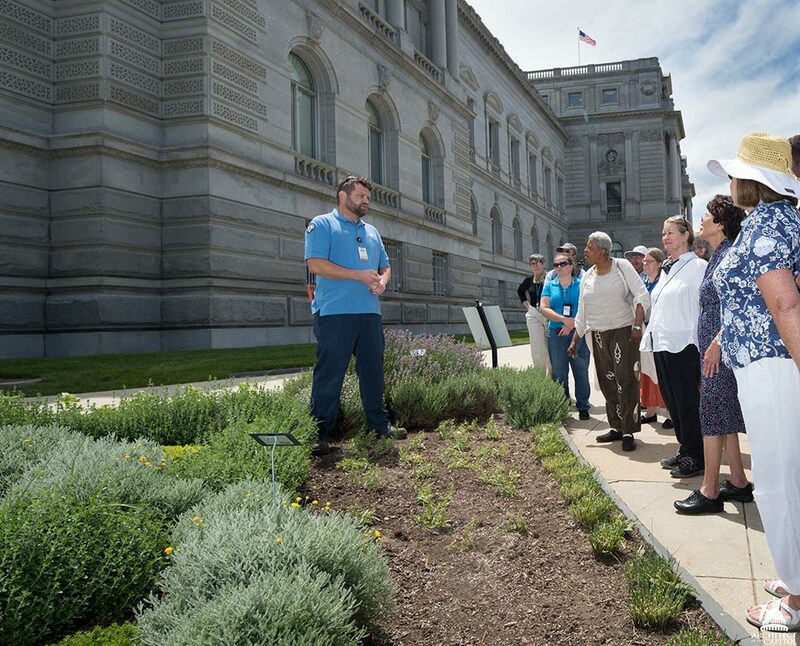 Throughout the summer, gardener-guided tours were provided to the Library of Congress Cooking Club, Library of Congress Garden and Landscape Forum, Library of Congress Gallery Talk, Library of Congress Health and Fitness Wellness Fair, and AOC staff. 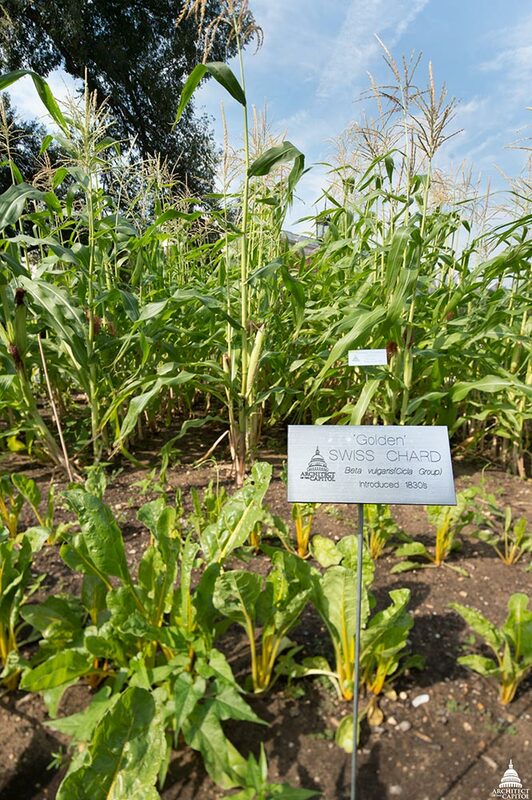 Nearly 300,000 social media users followed the garden’s progress from seeds to harvest online. The garden updates were consistently the most popular posts throughout the summer and fall. Enhancing Visitors' Experience Through Food: This summer, the Capitol Cafe menu items were inspired by the current Exhibition Hall rotation, "Congress and the World Wars" in the Capitol Visitor Center (CVC). Beef and mushroom meatloaf, war bread and flourless chocolate cake, all developed from recipes created by the chef and based on research into the rationing of the time period, were available to visitors and staff on the Capitol campus. "With these delicious foods, the new murals in the Cafe and exhibit-inspired items in the Gift Shops, we are creating a unified Capitol experience for our visitors," said CVC CEO Beth Plemmons. 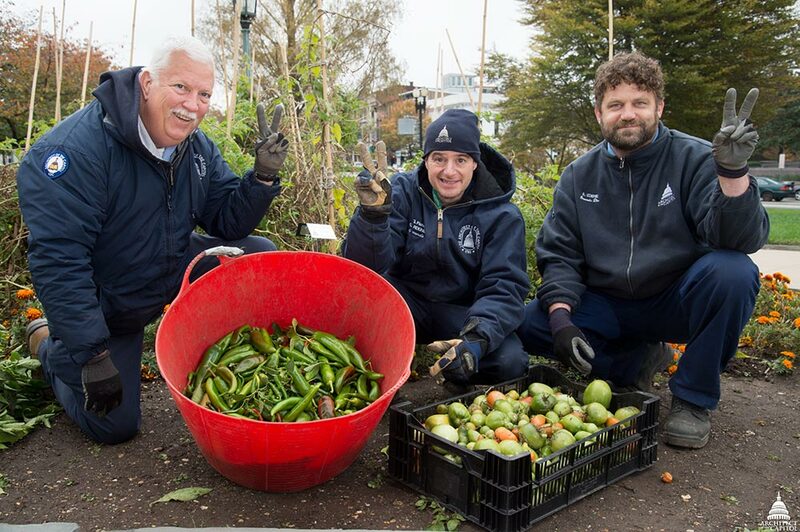 The gardens produced hundreds of pounds of food for charity. The primary purpose of the gardens is for educational display, however, crops harvested from the beds are donated to a local nonprofit. More than 400 pounds of produce was donated by the end of August with additional harvests expected through the remainder of the year. "One of my favorite memories from this project happened the Monday morning after the first harvest. I opened the fridge in the shop to put my lunch away to find 54 pounds of turnips cleaned and stacked neatly on all the shelves with nowhere to put my lunch. It was quite a surprise to see that many turnips," said Belcher. 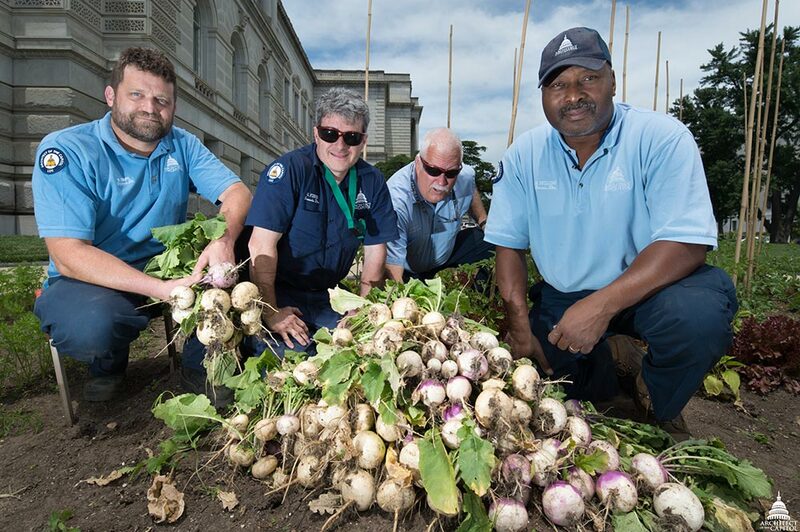 Those turnips, and other produce from the War Gardens, were given to local nonprofit and social enterprise, DC Central Kitchen. The organization will use them to prepare the 5,000 daily meals they provide to nearby partner nonprofits and homeless shelters. 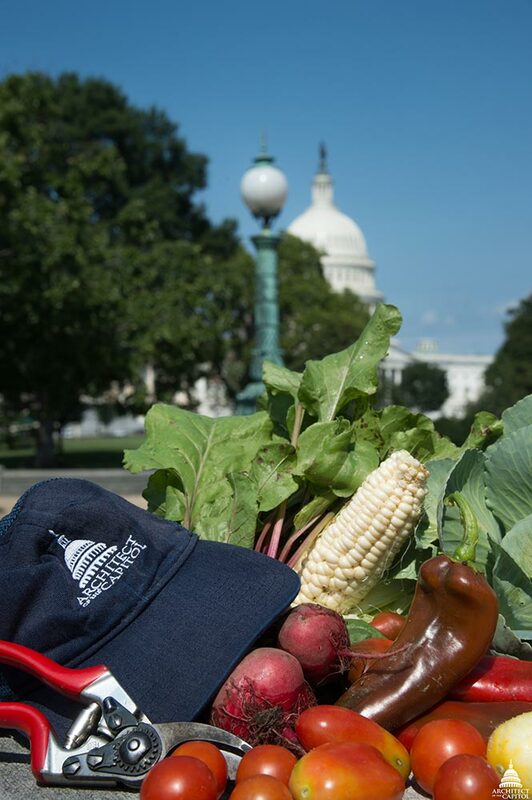 "Fresh, healthy produce donated by the Architect of the Capitol through the War Gardens project is helping food-insecure individuals across Washington, D.C., while also allowing our nonprofit partners to focus their efforts on their unique missions, rather than meal service. We appreciate the hard work of the gardeners to grow product worthy of a top-rated restaurant and donating it to us as we help fight hunger, and ultimately poverty, in the nation's capital," said Chief Executive Officer of DC Central Kitchen Michael F. Curtin, Jr.
Gimpel also has grand plans for the fall and winter harvests. He's hoping to raise money for the Combined Federal Campaign by auctioning off a giant pumpkin or bottles of hot sauce made from War Garden peppers or a salad lunch made from War Garden produce. Gimpel, the son of a veteran, believes "it's an honor to be a part of something that is commemorating the great effort and sacrifice of the troops at that time, and as importantly, how Americans on the home front came together to support the military effort, their country and their European allies." Excellent tour by Rob. The gardens are excellent and we have enjoyed them.